Many restaurants and chefs have looked to broaden their reach by offering vegetarian and vegan tasting menus. The tasting menu is a prominent part of the New York dining scene, with chefs using it as an opportunity to stage elaborate culinary performances, giving you an insight into their creative minds and the ideas that they're playing with. Over the past decade, many restaurants and chefs have looked to broaden their reach by offering vegetarian and vegan tasting menus, with the added benefit of highlighting local and seasonal produce. We've put together a selection of 7 vegetarian tasting menus in New York that we love, some of which are a permanent feature, and others requiring just a little bit of advance notice. Semilla is part of the vegetable-forward trend, where their 10 course-tasting menu relegates meat and fish (when they are used) to the role of an accent or garnish, but of course, you can go without either. The Williamsburg restaurant trades the dining room for an 18-seater chef's counter with a direct view of the kitchen, making the experience a lot more casual and relaxed. Chef Jose Ramirez-Ruiz, along with his partner and pastry chef Pamela Yung, serve up innovative dishes like a cabbage 'sandwich' (hint: it doesn't actually use bread), sunchoke chawanmushi and fermented oat porridge with beets and brown butter for dessert. Chef Yung also makes fantastic sourdough bread, which alone is worth the trip! 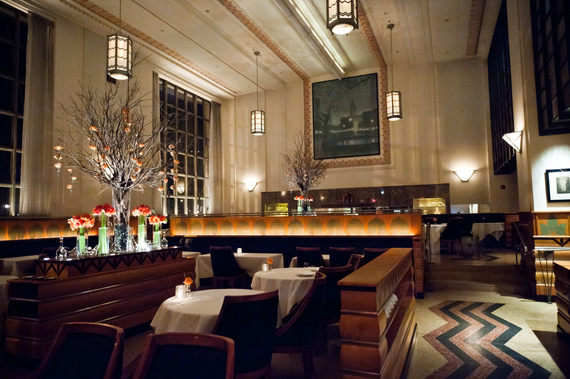 If you're looking for something a little more formal, then you can try Eleven Madison Park, where the art deco-inspired interiors and imposing floor-to-ceiling windows bring to mind a sort of dining cathedral. The tasting menu is a three hour-plus experience, where some recent vegetarian highlights included a grain-free celery root risotto with a delectable black truffle sauce, turnips prepared in four different ways served in a turnip broth, and a twist on some classic New York dishes, including the Waldorf Salad. Be prepared to put aside a full afternoon or evening for a meal at this three Michelin star restaurant, which doesn't include the food coma you may slip into afterwards! Serving up a 9 course tasting menu that's often been described as 'flawless', Per Se is acclaimed chef Thomas Keller's love letter to classical French cooking, with a modern American twist. If you take the veggie route, you may have a chance to sample dishes such as chilled Hass avocado soup, ratatouille or bean cassoulet; the menu is changed daily to make use of the freshest ingredients available. 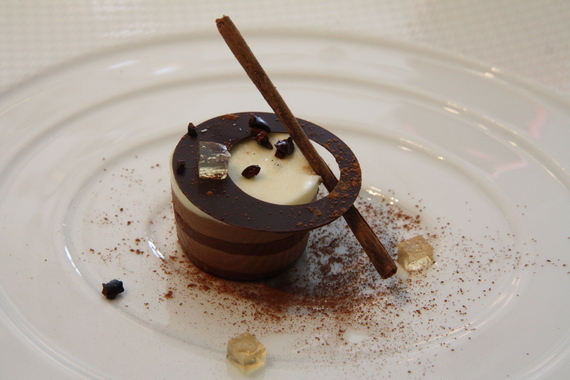 And nobody can resist Per Se's take on coffee and donuts, which finishes off the meal. Add to that an extensive wine collection boasting over 2,000 bottles, and it's easy to see why Per Se is considered to be one of New York's best restaurants. Monday nights are meatless at Dovetail, on Manhattan's Upper West Side, with a special vegetarian menu for spring and summer. The tasting is comparatively short, at only four courses, with each of the first three giving you a choice of dishes to select from. You could, for example, find yourself deciding between the barbecue parsnip rib or the braising greens lasagna. Executive Chef John Fraser, who's honed his skills under Thomas Keller, likes to get playful with his food, sometimes choosing an enigmatic name like 'Fuji Apples' that will leave you guessing at the exact preparation until it arrives at your table. Yes, we know, Westchester is outside of the five boroughs, but Blue Hill at Stone Barns is too good to be left off this list, and the New York City outlet just doesn't compare. It's about a 45-minute drive from the city, but is completely worth the trek! The restaurant at Stone Barns is a sprawling farmhouse with an elegant dining room inside, and most of the ingredients are grown right next door! The menu is adapted regularly to reflect the season's harvest. 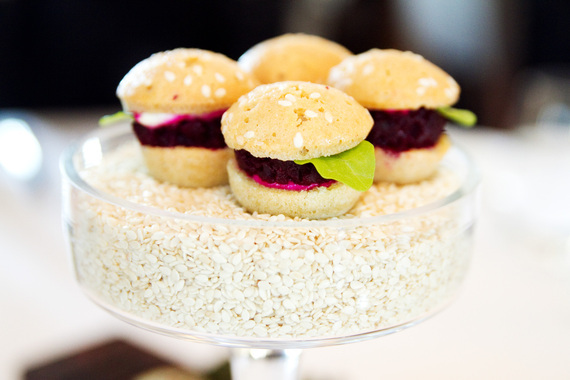 There are some frequently used elements, such as mini beet sliders, vegetable 'steaks' and an amuse bouche that's a 'fence' made of organic vegetables from the garden. But chances are, you will have a different experience on every visit. Translated from Japanese as 'fine day' or 'day of celebration', Kajitsu aims to turn every visit into a special occasion for its diners. The restaurant follows the 'shojin' philosophy of cuisine, which is practiced by Buddhist monks who don't eat meat or fish. Choose from the vegan-friendly 4-course 'kaze' or 8-course 'hana' menu, in which Executive Chef Hiroki Odo puts a contemporary Japanese twist on seasonal New York fruits and vegetables, finding creative uses for mountain yam, daikon and mushrooms. Although Kajitsu has lost a Michelin star recently, it's still one of the finest destinations for Asian vegan cuisine in NYC. If you're seeking out vegan or gluten-free dining options, you'll get both in abundance at Del Posto. Executive Chef Mark Ladner is hoping to make modern Italian cuisine more accessible to everyone with some innovative variations on the classics. As of 2013, all the pastas have a gluten-free option, including favorites such as luna piena, a circular ravioli with cheese and truffle butter, and pumpkin cappelacci, filled with rich pumpkin puree. Del Posto also appeals to the sweet-toothed among us by presenting a selection of indulgent, creamy desserts that don't involve even a drop of milk!